If you want to start your week checking out emo rock bands, make your way over to Pressed Cafe this Tuesday, July 4 to catch Nashville emo group Secret Stuff, Ottawa emo project Castefield, Ottawa alternative rockers Fragile Figures and Ottawa acoustic artist Nojah. The incomparable FET.NAT are playing live at the Record Centre this Wednesday, July 5. For the occasion, the Gatineau experimental art punk four-piece will be giving an all-ages free show. Gatineau’s first-ever Festival d’Humour (comedy festival) is happening July 6-8 at the Place De La Cité, in Gatineau. For this inaugural edition, you can expect shows by Rachid Badouri, André Sauvé, Philippe Bond, Mélanie Ghanimé and up-and-comer Jay Du Temple. The 2017 RBC Royal Bank Bluesfest is just around the corner and this year’s edition, being held July 6-16, is bound to welcome another record-setting number of festival-goers eager to take in all the live music. This summer’s lineup includes acts like Muse, Pink, LCD Soundsystem, Flume, 50 Cent, Gary Clark Jr., Tegan and Sara, Migos, Sam Roberts Band, July Talk, RL Grime, Xavier Rudd, Phantogram, A Tribe Called Red, Dead Obies and many others. David R. Elliott will be playing live in Ottawa this Thursday, July 6 as part of his Strawberry Grass Tour. For the occasion, the Halifax-based country/pop/folk will be sharing the stage with Chris Landry, Keturah Johnson and Ryan Prueter. Halifax experimental pop band Mauno are hitting the road as part of their Sled Run 2017 Tour and they’ll be playing live at Bar Robo this Friday, July 7. 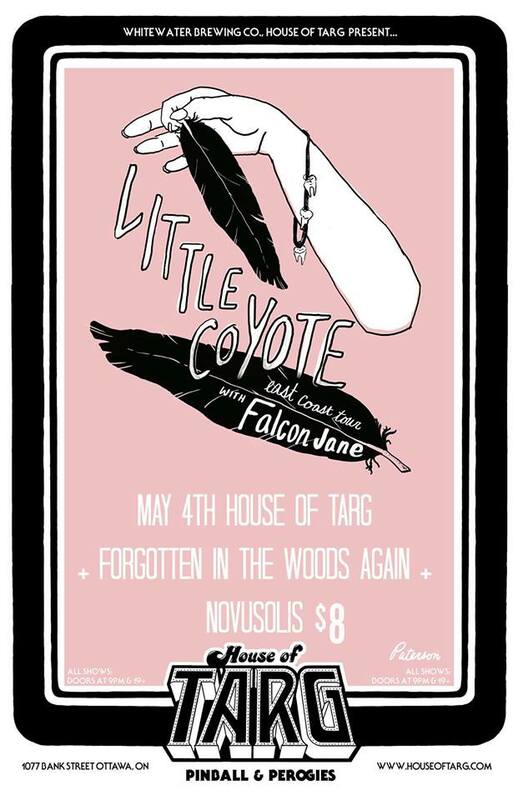 This time around, they’ll be playing an all-ages show alongside Winnipeg electronic psych pop project Lev Snowe, Winnipeg alternative group Ivory Waves and Ottawa lo-fi noise outfit Masters of Nothing. Over at House of Targ this Friday night, you can catch Wakefield, Quebec indie rockers Rebelle live with Ottawa indie garage band Nightshades, Toronto indie garage rock group Mad Ones and Ottawa lo-fi garage outfit The Vile Bodies. Double Barrel, one of Ottawa’s most popular monthly dance parties, is going down inside Babylon this Friday night. Resident DJ Magnificent will be gracing the 1s and 2s with selector Trevor Walker, and Detroit Soul Food will also be back to provide tasty eats. An all-vinyl funk, soul, Motown and vintage reggae dance party you don’t want to miss! This Saturday, July 8, Rewind, dubbed Canada’s premiere old school & throwback party, celebrates Canada 150 at both Petrie Island and Kinki Lounge. First up: enjoy a free beach party throughout the day until 8 p.m. and then make your way over to the Market to keep the party going at Kinki with DJs Mace and Lifeboogie. Ottawa singer-songwriter Matt Powell will be performing live at City at Night this Saturday, July 8. The indie blues/rock/soul musician will be playing with LJ Drums and friends. Support local talent! This Saturday night, the Mercury Lounge and the NAC present the next instalment of Wolf Gang Sessions, a night of music with a wild side where classical meets funk. For this special series, the NAC takes part of its orchestra out of its traditional space and puts a special spin on DJ Trevor Walker’s set. This promises to be a great night of live music. This Saturday, the Ready Steady Go Mod Nite is going down at House of Targ. DJ Emmett will host a night of live music followed by a swinging 60s dance party, which will feature live performances by a The Clash tribute band and Ornaments, who’ll pay tribute to The Buzzcocks. New Jersey folk/blues musician Sammy Kay will be making a stop at the Petit Chicago in the Vieux-Hull sector of Gatineau this Saturday. Burlington, Ontario punk rockers The Penske File, Ottawa-Gatineau punk rockers Sidelines and Ottawa-Gatineau ambient post rock duo Novusolis will be joining Sammy Kay for the show. Toronto’s Yung Bambii will be making an appearance at Open Air Social Club this Saturday night. The globe-trotting DJ is returning to the summer party patio for what promises to be another formidable set. Long Island punk Jeff Rosenstock will be hitting up Babylon this Sunday, July 9 as part of his summer tour. He’ll be sharing the stage with Brooklyn indie rocker Laura Stevenson and Toronto punk rockers DEFORESTERS. This April and May, Debaser presents Spring Thing, a series featuring six shows and nineteen bands. The fun starts this Monday night at Bar Robo with a live performance by Toronto band Century Egg and Ottawa projects Spell and Empty Nesters. Toronto power funk/soul group After Funk are back in Ottawa this Tuesday night as part of their The Freak Tour. For the occasion, they’ll be giving a live show at the Rainbow Bistro with Ottawa’s own soulsters The Hornettes. On Wednesday, April 5, catch Vancouver indie pop band Said The Whale live at the Bronson Centre. The Hidden Pony Recs signees will be performing live alongside Toronto indie rockers Fast Romantics. The Ottawa Fringe Festival #Fringe20 Encore series continues this week with An Adult Evening of Shel Silverstein, by Graham Price & James Richardson and The Root of All Squares, by Sterling Lynch & Sam Varteniuk. Check them out at Arts Courts April 6-8. Over at Bar Robo this Thursday, check out local band Django Libre if you’re in the mood for some live jazz. The group will be playing gypsy jazz standards and originals. This Thursday evening, Kinki Lounge presents the Genesis Art Vernissage. Inspired from her research on the condition of women and tribes from around the world, Genesis paints warriors to support the cause of female empowerment and mental heath. 15% of all art sales go to local organizations that support mental health and women in crisis. The event will feature spoken word, women-made culinary art from Tunisia and music by DJ RayRay. Ontario electronic/experimental project Pick A Piper (made up of members of Caribou) will be playing live at House of Targ this Tursday, April 6, and they’ll be sharing the stage with Montreal psych rockers Yoo Doo Right and Ottawa chamber/drone newcomers mal/aimé (featuring members of Pony Girl). Cold Capital is having their official album release this Friday at the Rainbow Bistro and they invite you to join them to celebrate the occasion. To mark the launch of their record, they’ll be playing live with Ottawa-Gatineau rockers Still Winter Hills and Ottawa bluegrass/rock n’rollers The Ramblin’ Valley Band. Ottawa alternative rockers High Waters don’t play very often, but when they do it’s worth checking out. They’ll be hitting the stage at Bar Robo this Friday night and this time around they’ll be joined on stage by Montreal electronic project Ghost Love. The charismatic Ben Caplan & his band The Casual Smokers are giving a live performance at the Shenkman Arts Centre this Friday, April 7 as part of their current tour. Joining them on stage for the occasion will be Ottawa indie folk singer-songwriter Jack Pine. French pop folk-rock project Trumpets of Consciousness will be giving a live performance at Pressed Café this Friday night. The band, which makes music somewhere between elegant psychedelism, quivering sixties-like melodies and high-end folk poetry, will be sharing the stage with Ottawa psych indie pop group How Far to Mexico and Ottawa indie folk rockers Lost to the River. This Friday night at the Mercury Lounge, Framework Music is hosting its annual German Sparkle Party as part of their anniversary celebration. This year, they’re turning 6 years old and to mark the occasion they’ll be welcoming special guest Ciszak from Brazil. If you plan on going, expect over the top with sparkly, flashy, and glittery deco. Double Barrel, one of Ottawa’s most popular monthly dance parties, is going down inside Babylon this Friday night. Resident DJ Magnificent will be gracing the 1s and 2s with his new selector partner Trevor Walker, and Detroit Soul Food will also be back to provide tasty eats. An all-vinyl funk, soul, Motown and vintage reggae dance party you don’t want to miss! If you’re into metal, make your way over to House of Targ this Saturday to catch Philadelphia atmospheric post metal band Rosetta, Ottawa post metal/rock group Destroy Clocks, Ottawa instrumental post rock project Clavius Control and Ottawa metalheads Black Oak Decline. Andy Chillman will be back in Ottawa after many years this Saturday, April 8. The London, Ontario folk musician will be playing live at Bar Robo with special guest Jad Hammoud. Montreal lo-fi folk-country four-piece Avec pas d’casque will be playing live at the Minotaure this Saturday night in an effort to promote their latest album Effets spéciaux. This time around, the guys will be sharing the stage with Gatineau-based indie folk band Maggie’s March. If you’re looking to boogie down to disco this weekend, head over to the Mercury Lounge this Saturday night for the Disco Lab party featuring mad scientists Trevor Walker and guest DJ Zattar who’ll be taking care of the beats. If you attend, you’re encouraged to dress in your best 80s look to get in for free.